Go fast go slow…who cares. Introducing Corsair Marine's newest ultimate regatta racer the 760R. 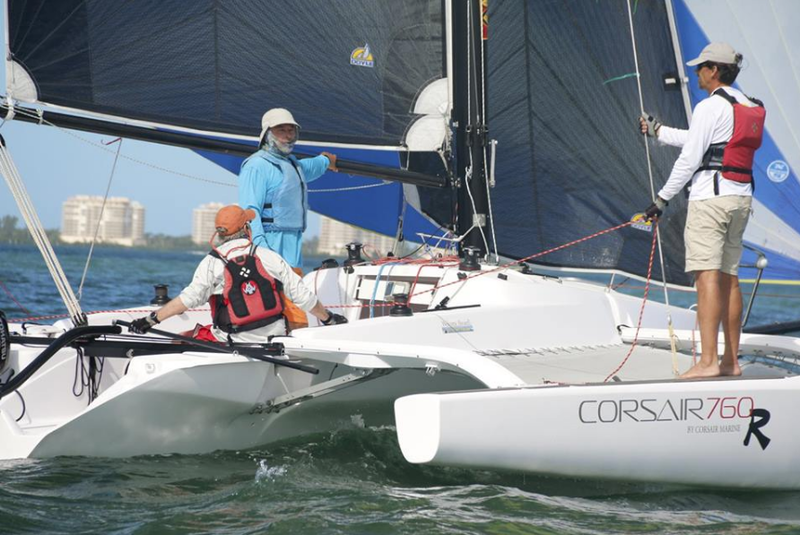 The new Corsair 760R is Corsairs ultimate regatta boat! Large open deck, fast, fun and affordable this 24-foot sports boat is the perfect day boat for families, friends and racers alike. Keeping true to the 760 range the new R version offers an identical underwater profile and sail plan however features a huge full length cockpit at the loss of internal volume and comforts. Unlike the other 760 Variants the R does not offer the versatility of sleeping accommodations and comfortable interior but is instead focused record breaking speed and a large open deck layout. Not only is the 760R is a competitive racer in the popular Corsair 750 fleets but will also punch above its weight in mixed fleets with multihulls over twice its size. It’s not all about winning races and breaking records though, at its core this trailerable sports boat is easy, safe and loads of fun! Rotating aluminum (or optional Carbon) wing mast with synthetic shrouds, stays and traps. Cruising mainsail, foresails and boom cover. Two self-tailing winches, size 20; Stainless steel forestry; Furling boom. Spinnaker hardware includes a retractable aluminum bowsprit (Optional Carbon) with synthetic Bob-Stay; Two cockpit winches size 20; High-performance blocks. 5: 1 cunningham & 8: 1 mainsheet; 6: 1 large sheet block; 2: 1 traveler. Retractable dagger-board & rudder blade. Anchor locker with hatch and pulpit. Laminated security compartment and cockpit storage. Load capacity of up to 10 persons. Built according to ISO and CE International Standards. The cushion on the 760R is an optional upgrade. Optional mattresses size is 150mm ( 6” ) foam upholstered. If you're interested in knowing more about the Corsair 760R or 180 Marine, we'd love to hear from you. Please use the form below, that will get the quickest response... or phone 303-669-6210 Thanks!